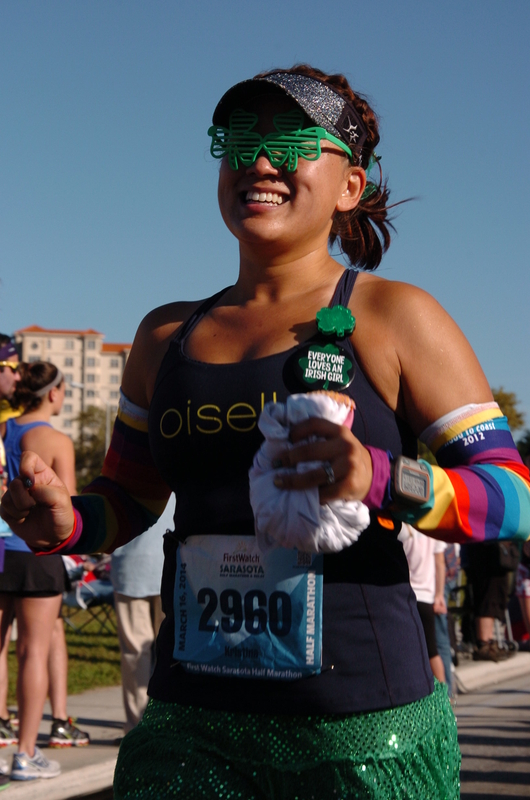 Backstory: WAYYYYY back in June 2013, I took advantage of a “National Running Day” offer and registered for the 2014 First Watch Sarasota Half Marathon. We were still living in Virginia, but we had just made the decision that we’d officially be moving to Florida, so I was extremely psyched to be “in” for my new hometown’s signature endurance event. So, of course, we moved, and just as I had hoped, I fell in love with the city of Sarasota, and so, was even more excited about this race! This race fell three weeks after 26.2 with DONNA, so I knew I would not be making it a “fast” race, since I was taking the full two weeks of recovery. Through an awesome turn of events, my friend Jillian was able to come down from Orlando (along with Stephanie and Dee Dee) and like that, a weekend of fun was assembled! I met up with the girls for dinner the night before, and many shenanigans were had 🙂 We laughed so hard, I think it qualified as an ab workout!! It was nice hanging out in the car, and I reclined and lounged for a while, before meeting up with the girls. I set my alarm on my phone just in case I fell asleep, but I guess my adrenaline was just so high that that didn’t happen!! With Jillian and Dee Dee. After a few pre-race pictures, a portapottie stop, and the upstream swim through the starter chute, Jillian and I lined up in the ~10 min/mile zone. The race went off a few minutes late, but nothing too bad. Soon, we were hitting the streets of Sarasota, en route to St. Armand’s Circle via the John Ringling Causeway, where we were greeted by the sounds of bagpipes, and the most magnificent glowing moon, which was setting into the bay! I tried to take a picture, but it just didn’t do any justice. I had run the bridge a few times before, but nothing compared to the feeling that morning! Light was pouring over, and there was just this sense of optimistic energy permeating…our footsteps were light, and we powered up and over with nary a care. 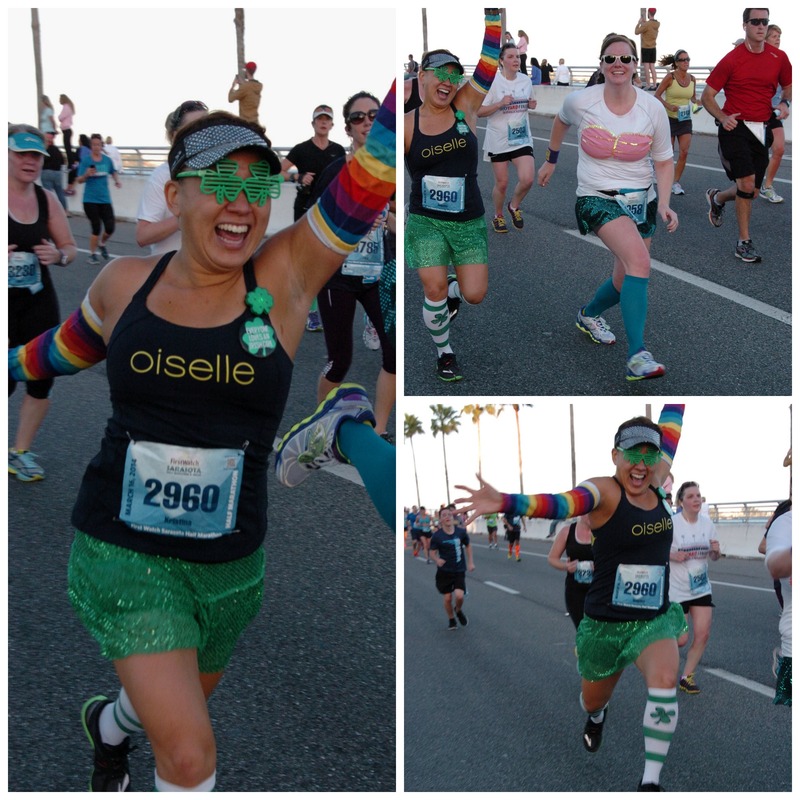 We kept moving, and cheered the front runners as they stampeded back toward the mainland. Jillian asked for a quick walk break, and so we pulled to the side, and admired the quaint shops and restaurant fronts of St. Armand’s, before picking it back up on the out and back. The second bridge climb was a bit steeper, but our pace hardly dropped – we were hovering right in the sub-10 minute range at that point, and hit the cruise control right on back toward the Van Wezel, nearing the half-way point already (and the relay exchange zone). Once we set back out, the course had narrowed as it hit US 41, which bottlenecked for a little but, but wasn’t too bad. We pulled onto the sidewalk when needed, as the sun was rising up a little higher. I took advantage of this time to grab a few pics of Jillian running, which was fun! The “turn off” point of US 41 was onto a familiar road – directly toward the Ringling Art Museum! We jump, skipped and hopped that straightaway (still waiting to see if that picture came out that the MarathonFoto guy asked us to do, lol) then made our way down the lovely, shaded neighborhoods of Indian Beach/Sapphire Shores. 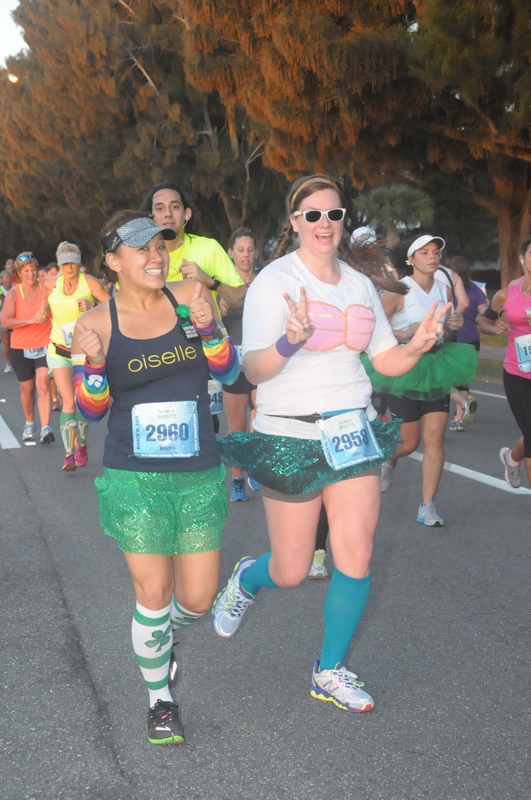 The mood of the runners was very positive! I got a lot of high fives and smiles (thanks to my crazy outfit, I am sure) and even had the time to chat up a few energetic participants/volunteers and spectators. Jillian was still looking great, though she was insisting she was feeling otherwise 😉 no matter, I was gonna get her to the finish with a great time – both in subjectivity, and timing chip wise. I was able to snap a few signs set out by the event sponsor, First Watch, which was definitely fun – and before we knew it, we were back on the road, headed toward the Van Wezel, and the finish line, flanked by lots and lots of enthusiastic spectators!! 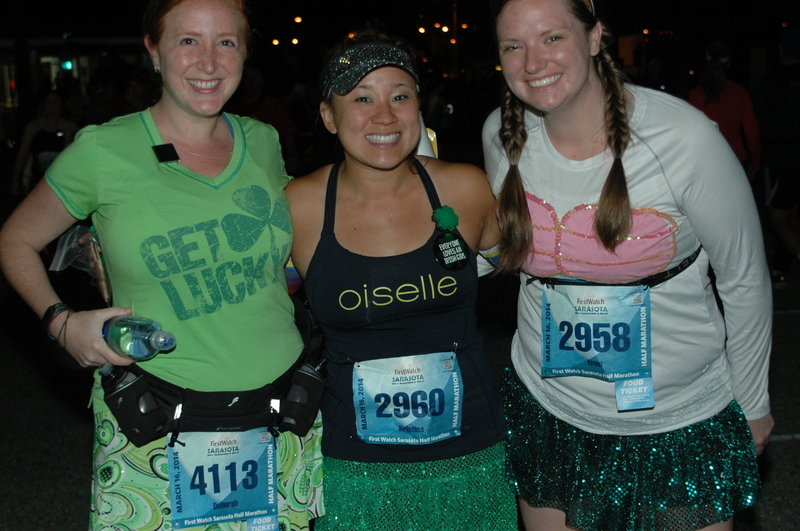 Glancing up at the clock, we were coming in right under 2:25 (official 2:24:16) – not too shabby! 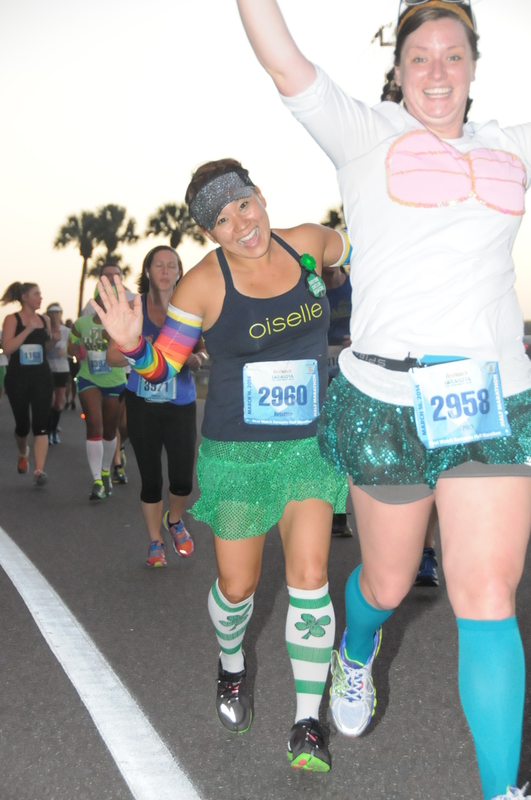 As my 14th half marathon, it clocked in as my second slowest (remember the fun fest of 2013 Tinkerbell Half??) but was so much fun, I already registered to come back again in 2015 (check out the blitz registration here – at a price even lower than I paid last year). I loved this event, and found it to be a great value. On top of a great race, fun swag, and yummy post-race goodies provided by First Watch, I felt happy and proud of “my” hometown event, and invite anyone interested in seeing the beautiful city of Sarasota to COME ON DOWN next year to check it out! I am sure I will run this every year that I can! What events does your hometown put on? Your pics are great! Looks like you ladies had a blast! Great job on a fun finish! I freakin adored this race. For my money, the best Florida (non-Disney) race around 🙂 Great recap, looks like you felt quite like I did! You are so freaking adorable. That is all.